HOUSE SWEEPS ! 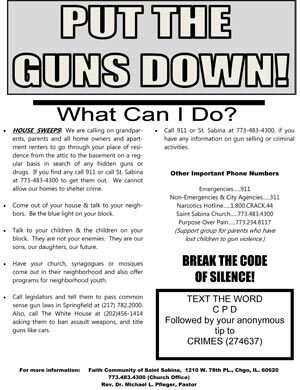 We are calling on grandparents,parents and all home owners and apartmentrenters to go through your place of residence from the attic to the basement on a regularbasis in search of any hidden guns or drugs. If you find any call 911 or call St. Sabina at 773-483-4300 to get them out. We cannot allow our homes to shelter crime. Come out of your house & talk to your neighbors. Be the blue light on your block. Talk to your children & the children on your block. They are not your enemies. They are our sons, our daughters, our future. Have your church, synagogues or mosques come out in their neighborhood and also offer programs for neighborhood youth. Call legislators and tell themto pass common sense gun laws in Springfield at (217) 782.2000. Also, call The White House at (202)456-1414 asking them to ban assault weapons, and title guns like cars.